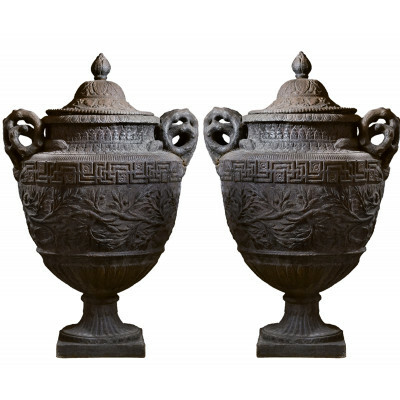 Dating from the 19th century, pair of cast iron vases with a vegetal decoration. The covers of the vases are adorned with a frieze of leaves and a pearl edge.The body of the vases is composed of a Greek frieze in its upper part, a set of olive branches including the leaves and fruits, four birds come to harvest and finally a part of a godron.This set is based on a pedestal himself dildoed. The model of this vase is found in the catalog of the A.A.Durenne art foundry of 1868, plate 179 (our illsutration).